Self-teaching is perhaps THE best habit you can get into. The alternative is to treat knowledge as something only gained from enrolling on a course, and spending time in front of a tutor. This invites the perfect excuses not to learn : no time and/or it's too expensive. Also many people delegate tasks to others that they could do themselves with just a little self-teaching. With the internet, now you can learn whenever you have free time, and for no cost (there's always a free alternative online for whatever you want to learn). More details on how being an autodidact helps you here. Why are you launching this new website of yours? What is the goal of it? As obvious as that sounds, ask yourself that question. From that question, you'll find many more questions follow. Normally the basic goal is to make as much profit from the site "as possible". Nothing wrong with that - it helps feed you and your family. Now the follow up question SHOULD be : HOW can I achieve this goal? "By achieving the maximum amount of customers buying my product/service". How do I find these customers? How do I convince them to sign up to my service or buy my products? Now you're on the right path. These questions are the right questions. "Can you make my site look like such and such a website?". That's a typical opening requirement I get when I get an enquiry for a website. I reply back with "what is the purpose of the site?". And from that point I can establish if such a design can help facilitate or hinder the principle purpose of the site. Maybe the design they require isn't search engine and visitor friendly. Maybe it's inaccessible to the disabled, maybe the navigation layout is confusing to everyone. Bear in mind also that there is such a thing as optimal web design when you consider measurable attributes like search engine friendliness, usability and accessibility. Specific requirements will either conflict or help facilitate the overall purpose of your site, and your website developer should tell you if conflicts arise (if the conflicts are technical which they often are). When that happens, go back to the first, principle purpose of your site and ensure your website can answer all the follow-up questions. Your website is like a car that MUST take you from A to B everyday without fail. A website MUST help facilitate your principle goal, and not hinder it in anyway. More details on a kind of "hierarchy of need" here. Many companies are selling online successfully without really distinguishing themselves from their competitors. They have most likely established themselves in their market so they simply become a known brand, or are spending a lot of advertising money to aid online sales. It is entirely possible to make a good living selling online without really distinguishing yourself from your competitors. However, if you're a small business/start-up, you're just making it harder for yourself! It costs more to advertise a product/service that appears indistinguishable from other vendor's products/services. Why create this hard work and expense for yourself? Many companies have little confidence and so copy the style and substance of their competitiors. Deliberately NOT being unique is like a race to the bottom. being an enthusiast! It helps to love what you do/sell. Not truly being enthusiastic about what you sell (not BELIEVING in what you sell) creates a flat sales pitch and lifeless content on your website. Being an enthusiast means you can sell your product/service naturally which is the best (and easiest) way to sell. By distinguishing yourself in some way, visitors are far more likely to remember you and come back to your website, as well as recommend you to others. Visit your competitor's websites and see how they are selling online - find out about their prices, services etc. By learning about your competition, you can learn how to distinguish yourself from them. Sales hyperbole ('unbeatable value', 'the best X on the net') tells your visitors nothing useful, since most of your competitors will also use this unoriginal style. Make your competitors look stale by avoiding these clichés. Again, let your competitors engage in a race to the bottom. You need to compel users into making a sale with simple facts - give visitors clear and simple reasons why they should buy your products. Give a sales pitch in plain English, which is much more powerful than blunted and worn-out phrases. Also, more discerning visitors are put off by spelling, grammar and punctuation mistakes; don't put them off! (something we still spot on THIS site from time-to-time!). Don't create too many categories though, even if you're selling online a wide variety of products. Too many categories and your site suddenly becomes much more difficult to browse for your visitor. Keep your main categories down to 10 or less. You can always break these main categories down into sub- and sub-sub categories. Search engines will follow all these categories, so your sub-categories will also get indexed - do not worry! Make your product names clear and succinct - don't call them by an obscure product code, unless that product code happens to be well known in your market and a useful search term. Again, try to include a useful search term in the product name. For example, if I'm selling Nike Air Jordans, I might use the product name "Nike Air Jordans basketball shoes" just to include the full product name as well as the basic category name it belongs to. It's explicit while including an extra instance of the keyphrase 'basketball shoes'. Make sure you have hi-res, clear photos of your products you are selling online. Photograph them from different angles, and try to include 3 or 4 images per product. This helps your visitor 'weigh up' the product and makes it much more tangible. Mention the product name often in the description without it sounding unnatural. This helps with your keyphrase density (and your product detail page should be optimised to the product name). 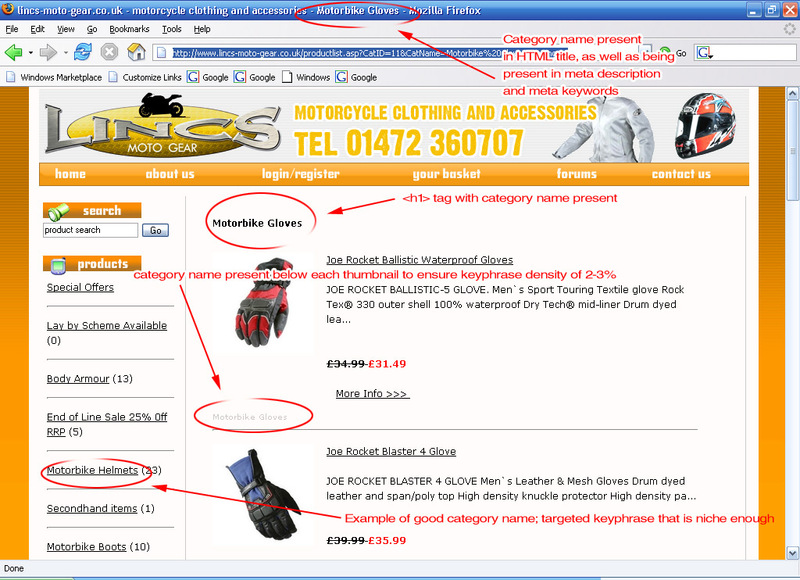 We have developed our own keyword density tool to check your product page with. Keep descriptions detailed and interesting; the description is your sales pitch - it can be the dealmaker or dealbreaker - it's also more content to be indexed onto search engines. Don't just copy and paste some sales literature - keep it fresh and original, and ultimately useful for your visitors. Give your visitors a reason to bookmark your site - keep adding new content - start a blog about the industry you're in; write articles telling your visitors new useful ways your product/services can be used. Search engines also like websites that are constantly updated and favour them. When selling online, your item prices should be set to 'optimal' to maximise sales; this value isn't always apparent until experimenting with the price of each item. Your visitors may like your items, and be convinced by your promises of service, and trust your company, but the price may prevent them from buying. Create special offers - putting items/categories on short special offers to learn where these optimal prices can be found. Sometimes prices can be too LOW and visitors view your site suspiciously! People visiting your site are looking for signs of trustworthiness when browsing your site - a lack of trust is a guaranteed deal-breaker. One tip to get your visitors to trust you is to have a nice big telephone number on the top header part of your web-page, that features throughout the site. Let people know your 'open hours' for the phone too - they won't expect you to be 24/7 if you're a small business. It means there's somebody physically running this site - someone to talk to at the very least. It's also good for your sales as you're more likely to convince somebody by talking to them than you are by text on your webpages. Reassure your visitors - give them a money-back guarantee if possible. Write your terms and conditions in plain English, and keep them to an absolute minimum - see how FEW words you can write your terms and conditions in. More details on short-term and long-term trust. Search engines like trusted websites - they want their results to be sure and reliable, and hate sites with no track record of trust. You can get your own 'trust track record' by creating original content that is constantly kept up-to-date. This will give your site more value in the eyes of other website owners who are far more likely to link to you - these should be website owners who also have original, fresh content. Reviews. You can legitimately buy reviews of your website which get you fantastic links from pay-for-review directories. There's no substitute for a Yahoo! directory listing or a business.com listing which are really good authority links (if expensive, still a great investment, even one of those links helps a great deal). Guest posts. Write informative and unique articles on other websites and get a clean, branded link back to your site via the "bio" box. Even in these post-Penguin days, you will be safe with these kinds of links so long as they're from sites relevant to your own and have SOME authority. Contribute on forums. Joining a forum and contributing to it helps build trust. Pick forums in your website's niche and help other forum members with their questions/queries. And of course, don't be shy with placing links to your website in the posts you make on the forum - all good if you're seen as a trusted forum member. Submit your website to niche directories. Niche directories that are human edited and have their entries reviewed by a human being have value in the eyes of search engines since they act as a basic filter for search engines. Hunt out human-reviewed directories in your niche and submit your website to them. Whatever you do, avoid begging for links via emailing companies. It's proven to give you a poor return for the amount of time you spend. It also annoys companies with an unsolicited email. Proactivity is investing time in doing something, not squandering it! In that way, link building with the above tips gives you a good return for your time invested. The internet is full of speculators. "You have to speculate to accumulate". That's true to a certain extent, but not when it comes to running an online business. Sure you can speculate when doing keyword research (that's where speculation is a good thing), but there comes a time where you then must commit to a business and keep going til it's a success. If I had merely speculated on puresilva.com being a success back in 2006, I'd have given up when it was just getting a handful of daily visitors month after month. Instead I committed a relatively modest amount of time and effort into promoting the puresilva.com website via link building and content creation. Simple advice, but in the age of the slogan 'work smarter, not harder', it's often over-looked: persevere with your website. It will not be an instant success. The quietest, most unsuccessful time will almost certainly be the first few months of your site's existance. A horrible misconception is that everthing is magically automated online, including making money. It isn't. It involves some hard graft, but not as hard graft as running an offline business (e.g. high street shop)! Your level of success is determined by a number of things, and the most important one is how determined you are for it to succeed. Commit at least 4 to 5 hours a week to content creation and link building.